Happy March, my friends! 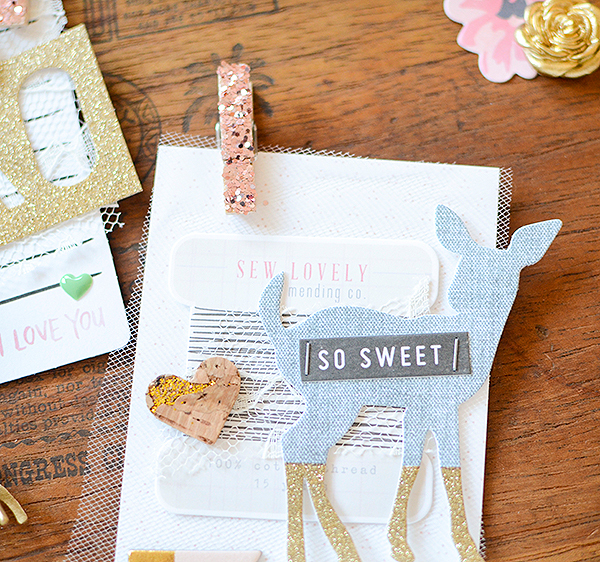 I'm so excited to bring you my first works from the new Gossamer Blue kits. 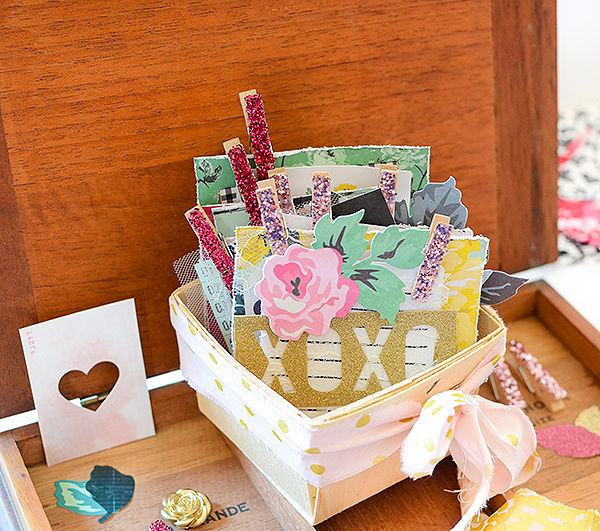 The kits this month include coveted collections by Maggie Holmes (Crate Paper), Pink Paislee, Shimelle, and My Mind's Eye. Of course there are also the awesome LP cards, stamps, and wood pieces made especially for the GB kits, too. These kits are going to go fast, I have a feeling, so you probably want to hurry on over to their shop and grab all the things before that happens! Staying true to myself, I made another bunch of tags. 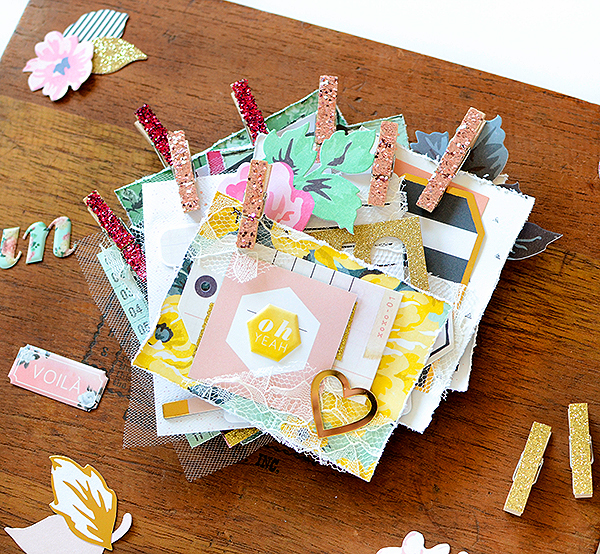 It was so easy to do this month, seeing as the kits were full of my favorite things...hot color, classic patterns, bold florals, and bits of gold. I didn't want to stop creating and still have loads of goodies untouched to use on future projects. The only reason I did stop was because I had to photograph and blog about the work! I'll be sharing my projects bit by bit over the next few days, and throughout the month, but you can always see sneaks in the GB Gallery. Most of my teammates went overboard creating, as well, and there is so much to see and marvel at so I definitely recommend having a look over there when you have a couple hours to spend. 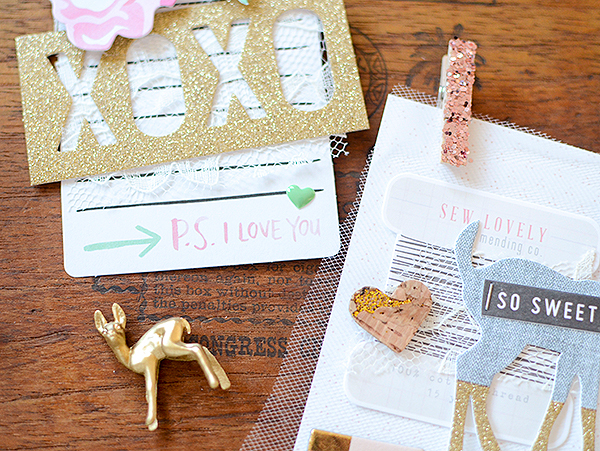 This week, I'll be sharing all the tags I made, starting with this this pair of soft and sweet ones. 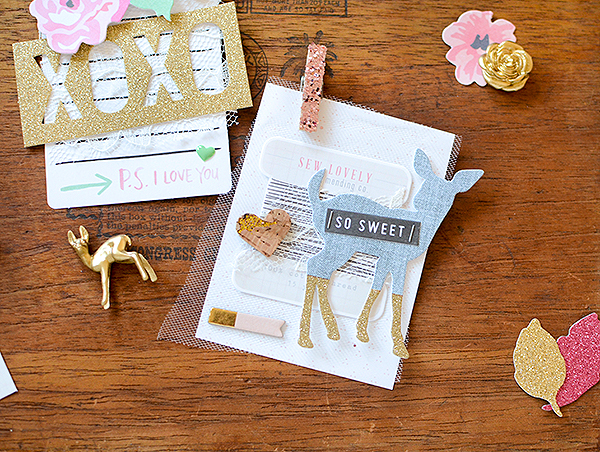 I still can't resist a cute deer and the ones found in the Bloom collection are no exception. 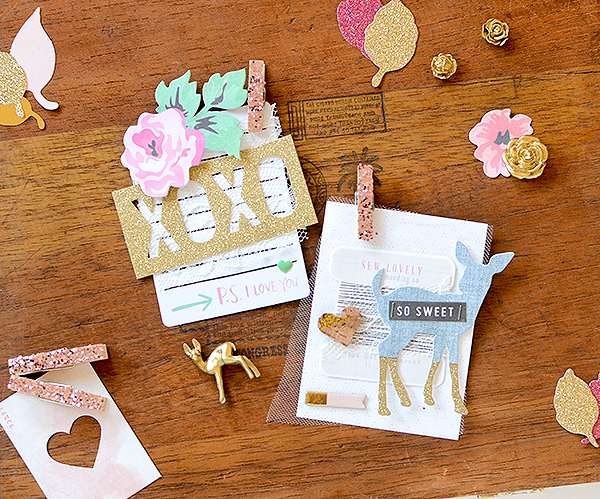 The die cuts here are all from Bloom and the pack is found in the Bits & Pieces kit. 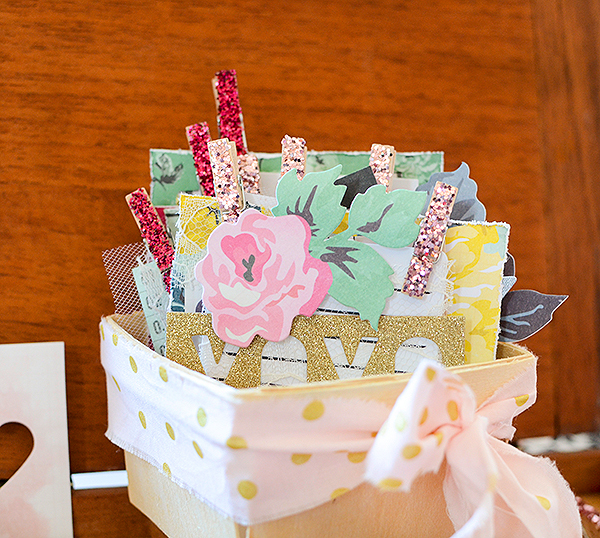 I used a darling Life Pages card as my base, and added a layer of pale pink tulle over it for texture. 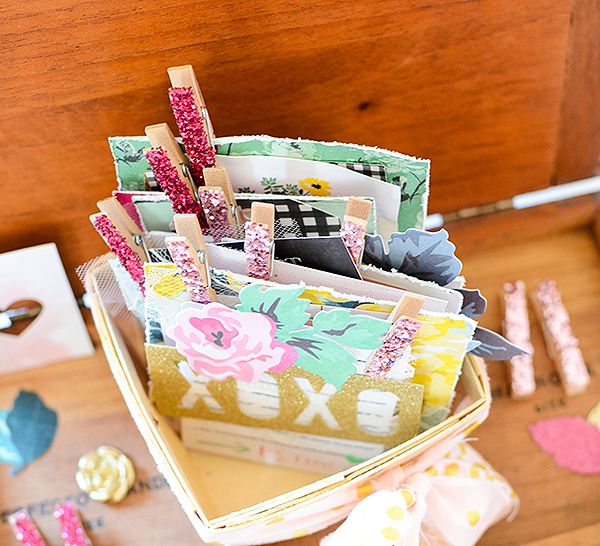 I've been using these rose glittered clothespins on everything lately (I made those myself). They're so sparkly and feminine and I swear they match everything! And may I just say those cork and glitter hearts are even more stunning in real life?! The second tag was so simple to make! The base is an Amy Tangerine card and the '---> P.S. I love you' sentiment just happened to exactly match a Maggie Holmes die cut floral so that worked out well. (And the tiny green enamel heart from My Mind's Eye also matched! Serendipitous or popular--I'll let you be the judge ;) The glittered XOXO frame is enough of a statement on it's own, but it also looks pretty here, with the pink and green additions. I've actually got two more tags in the works to go along with this pair, but I couldn't decide on their finishing touches so they remain incomplete at this time. I do have 2 other tag trios to reveal later in the week, though, so I hope you'll come back for those. And again, there is inspiration all around--in the GB Gallery, a lot of the girls are sharing projects on their blogs today, and of course, there's the Gossamer Blue Blog itself. 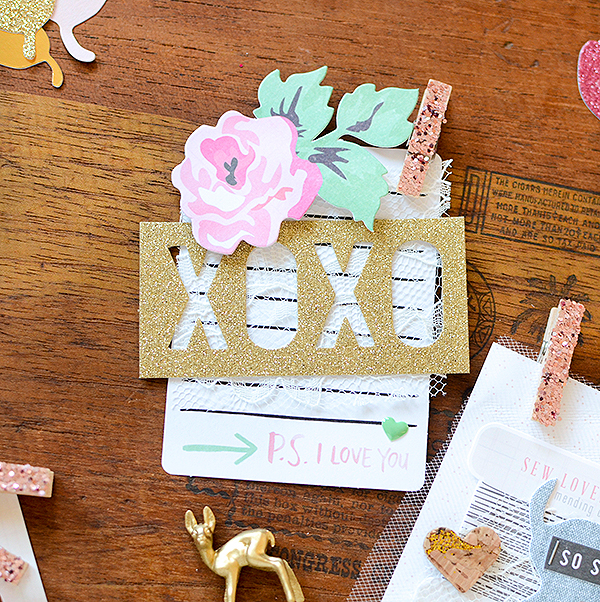 Andrea (@retrohipmama) has an incredible post on how to use the printables that are included each month when you subscribe to the kits. I will confess to A.) never having used them because, B.) even though I own a Silhouette, I don't really know how to use it. So I've bookmarked this post and I know I'll be referring back to it over and over again! Silhouetting aside, I'm always here if YOU have questions about anything I've posted, so ask away!